Run by local parents, we offer support, information and friendship to new parents and parents-to-be in Norwich and Norfolk, covering postcodes NR1-NR28 and IP25-IP26. We're not here to tell you what to do, but to support you to make the choices that are best for you and your family. NCT is here for all parents. Our groups, services and sales are open to everyone, members and non-members. Showing your support by becoming a member helps us to help you and other parents. Members receive NewGen, the NCTs exclusive members magazine and our branch newsletter 'ABC' and are the first to find out about local events. Be empowered to make the decisions that are right for you and your family. Antenatal Classes can be booked in various locations across the county, giving you the chance to make friends who are expecting babies around the same time as well as a space to learn about what choices you have in planning your birth and life with your new baby/ies. We also run Refresher Courses for second, third or fourth time around. We want all parents to have an experience of pregnancy, birth and early parenthood that enriches their lives and gives them confidence in being a parent. We run coffee groups and events across the county, as well as supporting you in feeding your baby, planning a home birthor vbac (vaginal birth after caesarean). 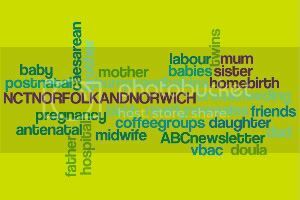 We have links with NNUH Maternity Services Liaison Committee to feedback parents' experiences of maternity care in Norfolk and Norwich. You can give them feedback directly about the care you have received, both positive and negative by email.